I found this while shelving Teen books at the library where I work. 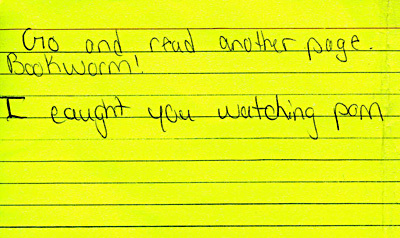 The fluorescent yellow caught my eye as it was sticking out of a copy of Dramarama by E. Lockhart. It particularly made me chuckle because I imagine the first writer trying to use “Bookworm!” as an insult only to receive this comeback, which I think would pretty effectively shut him or her down. Don’t mess with us bookworms! It’s not a put-down and a come-back.. It’s all one note; the handwriting is the same on both lines.